Warning! If you have a swarm of bees that are threatening the safety of you, your family or your neighbors, don’t hesitate – call your Montebello bee removal experts at Bee Busters! Montebello bee removal has been provided by Bee Busters for over thirty years. Our innovative methods set the bar in bee control. We were the first to use laser thermometers to find honeybee colonies in walls and use a device called an “injector” to vaporize pesticide and completely fill the void space bees are living in for an effective and humane kill. When you see another company putting pesticide dust at the hive entrance in the hopes that over time it’ll weaken the bees enough to kill the hive, you can be assured they’re thirty years behind us technologically. There are many bees and wasps to be found in Montebello. 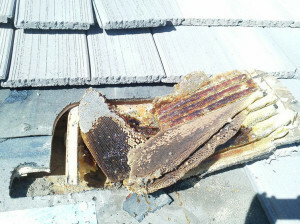 This is why its important to have a good Montebello bee removal service like Bee Busters. Bees, wasps, yellow jackets, hornets, and other related stinging insects will tend to swarm in arm areas a whole lot. Wasps in general can be really nasty and they spread like crazy. Bee Busters, the premier Montebello bee removal service, gets rid of these pests before they cause major problems. Many people are actually allergic to bees, so if you have a hive of them nearby, it could literally be a lethal danger to people who might be visiting your premises, or people who are living nearby. 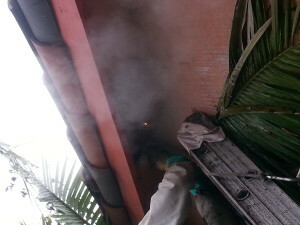 Bee Busters, Inc. is a bee removal company servicing Montebello and nearby cities. We provide residential and commercial services for removing unwanted bees and making sure that they will never come back. If you just try killing a few of the bees by yourself, you run the risk that you won’t get them all, and that they will just build up again without you even realizing it. Bee Busters’ Montebello Bee Removal – we ensure that potentially dangerous bees that may be living in your house or in the surrounding yard are safely and quickly removed in order to keep you, your family members and guests protected. 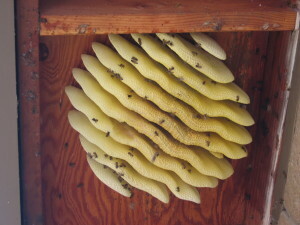 Montebello Beekeeping – A beekeeper is a professional who keeps bees in order to get honey from them. If you do it right, it’s entirely possible to have something of a symbiosis with bees. By giving them enough food and treating them properly, you can end up getting a lot of benefit out of the deal. Bee Busters has always been deeply linked with out origins as beekeepers. Our staff have served as presidents of the Orange County Beekeepers Association, performed countless presentations for a wide variety of audiences, and even participated in development projects and research in Africa and Asia. We aren’t merely “also beekeepers,” we are world class experts in the field of beekeeping. Contact Bee Busters, Inc. today at 949-497-6264 or 714-731-1959 for bee removal services in Montebello. You will be glad you did, and the more you wait the more time bees, wasps, and other similar pests have time to build up and become more and more dangerous to everyone in your area. Contact your Montebello Bee Removal Experts Today!